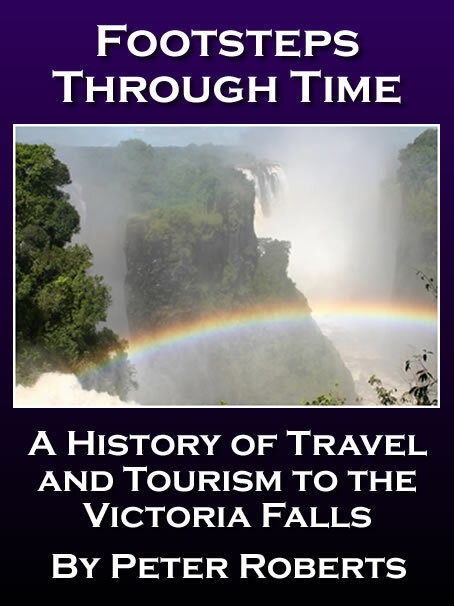 Livingstone's subsequent explorations took him far from the Victoria Falls, and he never saw them again. 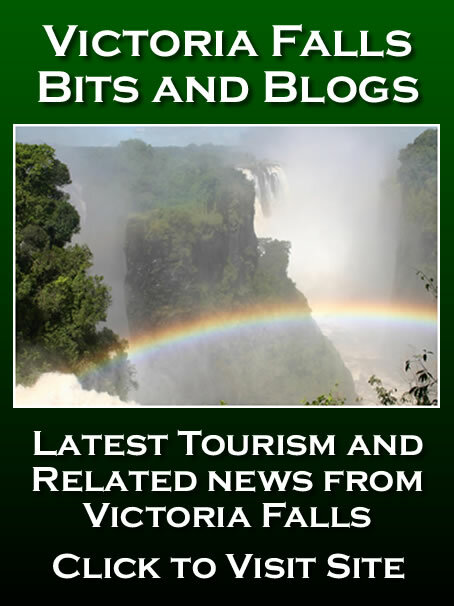 Following Livingstone's visit to the Falls, and that of William Baldwin, a few Boar hunters are known to have visited the Falls in 1861 but it is known that only one, Martinus Swartz, survived the return journey. After this, James Chapman and Thomas Baines visited in 1862, and both published interesting accounts of their travels. 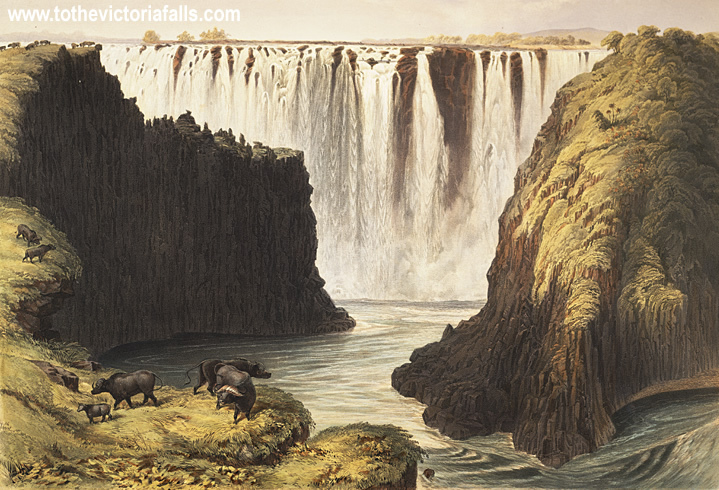 James Chapman, a hunter and scholar, had been near the Chobe in 1853, and - like Livingstone and Oswell on their first visit to the region two years previously - had been told stories of the Falls. 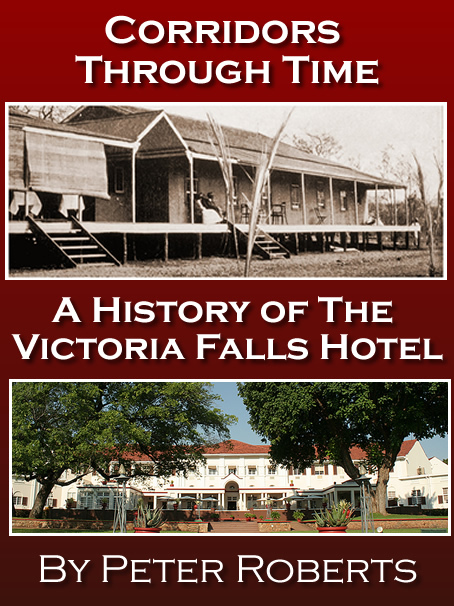 Thus he would have been in a position to anticipate Livingstone's discovery of the Victoria Falls by two years. "Here the panorama first broke upon us in all its grandeur, and I could not avoid the reflection that, could I but have known of the magnificent sight I lost in August, 1853, after being very near it, and how nearly I had forestalled Dr Livingstone's discovery, I should certainly have made another effort at that time to accomplish the object." The first to follow Baldwin were Thomas Baines and James Chapman in July 1862. Chapman, from 1850 onwards had travelled across the greater part of South Africa, hunting and trading, and it was his ambition to cross the continent and establish a chain of trading posts from sea to sea. As he was about to commence his journey he heard that Livingstone had forestalled him and had crossed Africa from Loanda to the Indian Ocean, and he therefore changed his mind. 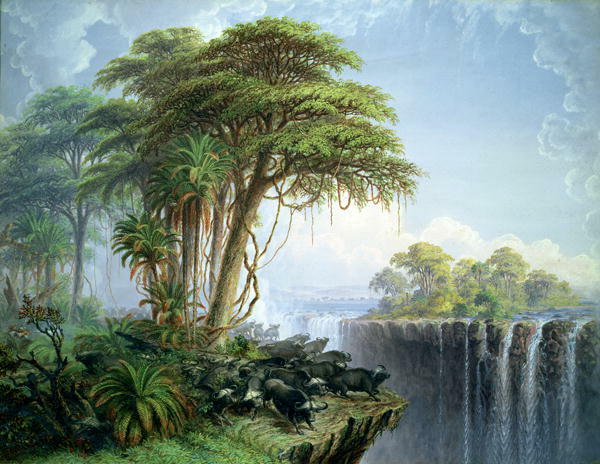 It is interesting to note that Chapman very nearly saw the Falls before Livingstone. Chapman was hunting near the Chobe in 1853 and heard from one of the native chiefs of the great waterfall three days journey to the east. He arranged with some Makololo to take him there, but after promising, they changed their minds and returned his gifts. It appears that they were frightened of the Matabele who were near there, and who had already attacked a tribe under Chief Wankie. 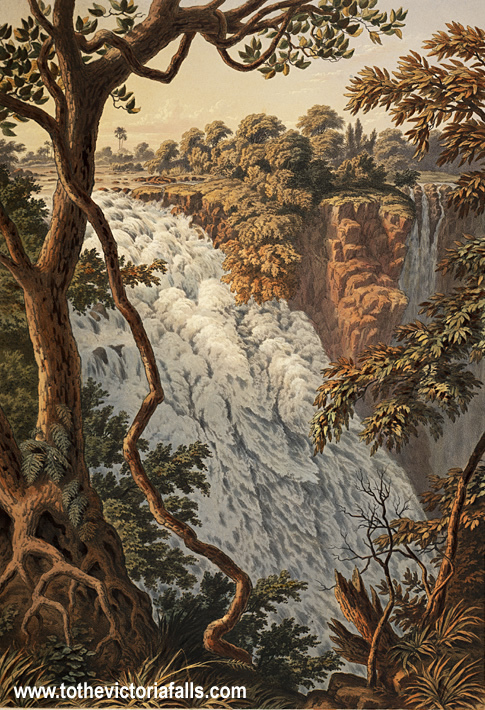 Chapman met Thomas Baines at Cape Town and they decided to journey to the Falls together. Baines had also been part of Livingstone's second expedition, but had been dismissed after disagreements with Livingstone's brother Charles. It is said that Baines hoped to meet Livingstone, and vindicate himself of the charges of dishonesty which he had made against him [he had been accused of appropriating stores for his own use, during the Zambesi and Shire expeditions.]. Such was the draw of the Falls that both men were determined to witness it for themselves. A hundred yards more east commenced the first grand vista of the Fall, comprising in one view near half a mile of cataract, stretching in magnificent perspective from the three rill cliff to the western side of Garden Island. The cliff was here of its original height, and the edge being apparently unworn, the height of the fall was greater, but of course the depth of water flowing over it was less. Beside this, from the absence of any material slope like that in the channel of the leaping water, the stream did not gather way, but flowed calmly and majestically onward. Shallows and ledges of rock caused rapids and miniature cascades, but these only partially broke the repose of the deep blue surface, till, reaching the cantle of its course, the mighty change took place. Wherever an equality of the rock formed a hollow to conduct a mass of water, there fell, sweeping more or less outward in direct proportion to its strength and volume, a jet more or less green and translucent for the first few yards, but quickly breaking into masses, from which the lighter particles, detached by their descent, formed comet or rocket-like trains of spray and vapour, till the whole, before reaching the abyss, was transformed into a broken, snow white, fleecy stream bearing but little resemblance to actual liquid water.. I remained till near sunset sketching, and, as in all the views I had taken about here, found that the magnitude of the principal features so dwarfs everything else, as rocks, trees, etc, which in common scenes would occupy a large portion of the picture, that I could hardly bring my pencil to a point fine enough to represent them. Still, unless these accessories are minutely and distinctly painted, the vastness of the whole is much invalidated. Baines called the western cataract, now known as Devil’s Cataract, the ‘Leaping Water’ (His Majesty King George VI, during his visit in 1947 showed a preference for this name), and the island next to it, ‘Three-Rilled Cliff’. This was later known as Devil’s Island and is now Cataract Island; Livingstone preferred the native name of Boaruka Island, which means ‘divider of the waters’, probably referring to its wedge-like shape. 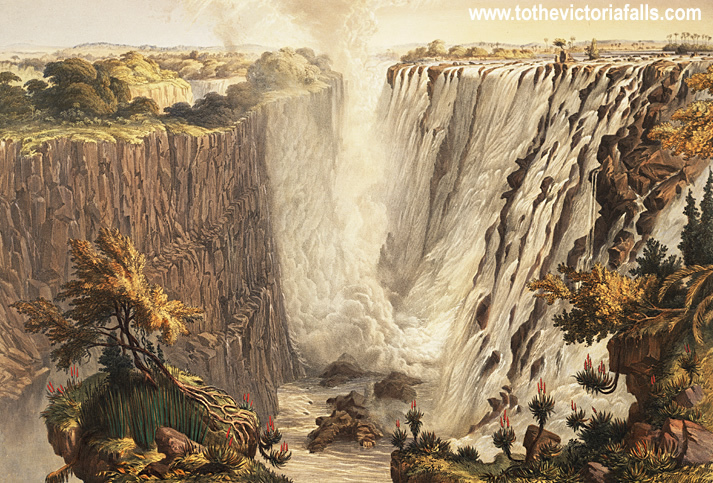 Baines and Chapman camped abreast of the ‘western end of the chasm of the Victoria Falls’, probably near the spot where the statue of Livingstone has been set up. They visited the ‘old boatman of the rapids’, Zangurella, who had ferried Livingstone and Sekeletu across to Garden Island in 1855, and he ferried them within ninety yards of the edge of the gorge on the east of the island. Livingstone’s garden was choked by undergrowth and overtrampled by hippopotami, but they saw the tree where Livingstone and his brother had cut their initials, D.L. 1855, and below, C.L. 1860. 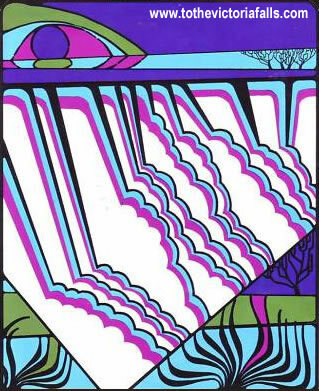 Baines, when he was standing on the very edge, ‘fronting a resplendent double rainbow’, was amazed to see his shadow cast in the foam, three hundred feet below. We approached the brink with trembling, and carefully parting the bushes with our hands, looked at once on the first grand view of the Falls at the western end. Picture yourself a stupendous perpendicular rent in a mass of basaltic rock, extending more than a mile (scarcely the half of which, however, is visible) and only sixty to one hundred and twenty yards wide, right across the river, from one end to the other, into which pours this mighty river – roaring, foaming and boiling. Then immediately before you, a large body of water, between eighty and ninety yards wide, stealing at first with rapid and snake-like undulations over the hard and slippery rock, at length leaping at an angle of thirty degrees, then forty-five degrees, for more than one hundred yards, and then, with the impetus its rapid descent has given it, bounding bodily fifteen or twenty feet clear of the rock, and falling with thundering report into the dark and boiling chasm beneath, seeming, by it’s velocity, so to entrance the nervous spectator that he fancies himself being involuntarily drawn into the stream, and by some invisible spell tempted to fling himself headlong into it and join in its gambols; but anon he recovers himself with a nervous start and draws back a pace or two, gazing in awe and wonder upon the stream as it goes leaping wildly and with delirious bound over huge rocks. It is a scene of wild sublimity. On the opposite cliff of this channel, star-like aloes with scarlet blossoms cluster against the sides of the deep brown rock; and beyond that we look into a dark and misty cavern, the depths of which we could not see. Three pretty snow rills, enveloped on sylvan vegetation, fall ghost-like through the veil of mist and disappear down this dark cave, the fit abode of Nox and Erebus. Beyond this we see a projection of bare brown rock over which no water falls, and then a perspective of white and fleecy waters, falling like snowy avalanches, slipping from an abrupt precipice into clouds of ascending mist. A general view of the Falls is thus obscured, and it must be seen or sketched from at least half a dozen points. The body of water which leaps down this narrow gap in the foreground (the channel of the Leaping Water) is probably the largest flow that is anywhere to be found in so narrow a compass. We had no means of ascertaining its depth; probably it is six feet; but it begins to be broken up into froth and spray and shattered into snowy flakes already before reaching the brink. There is no smooth fall of water anywhere, as is seen in the pictures of Niagara, the water not being deep enough; but it thunders down in white and fleecy masses that are lovely to look upon, and falls into a deep pond of sea-green water driven up against the base of the opposite cliff in large green crested waves, which rebound to whence they came, and then return writhing in agony to escape, finally waltzing and eddying out of the pond by a narrow outlet, now leaping over submerged rocks, and now dashed aside by masses of debris which have probably fallen from the summit of the sombre abutment of Three Rill Island as far as the first seam, as there is no corresponding concavity on the opposite side of the cliff. In the distance, at the farthest possible view of the rent, two, sometimes three, perpendicular falls of water are seen through the mist, contrasting strongly with the dark buttress before you, the bare rock and Garden Island all very much foreshortened; but then the revolving clouds of vapour, rolling from beneath and curling with centrifugal motion to the height of nine hundred feet, conceal the farthest view from this point. The opposite or southern cliff, which is the south bank of the river and faces the Falls, seems divided in three or four seams or stratifications of different ages, though of the same rocks, for which, as far as I could see, there are corresponding marks on the northern cliffs... We lingered at this spot until the sun was long past its meridian, the deep gulf before us rolling up large dense clouds of spray, on which the sun at our back, shining full on it reflects two, sometimes three lovely bows spanning higher and forming a double archway across the gigantic walls of the fissure. Rainbows so bright, so vivid, are never seen in the skies. The lower one in particular, probably from the contrast with the black-looking rocks below, was too vivid – nay, almost blinding – to look upon, defying imitation by the most skilful artist and all the colours at his command, yet imparting its heavenly tints to every object over which it successively passes. The colours in these rainbows are reversed, the upper one being blue, yellow and red, the lower red, yellow and blue. As the sun declined, the rainbows ascended until they reached the clouds of spray above the horizon. One segment of the bows is cut off where the spray ends, but the other end is still rising higher and increasing in depth, and as you retreat a little, it spans the whole river for fully a mile, imparting the most lovely colours to the spray-clouds which steal aloft like tongues of sulphur flame, until lost to view by the downward course of the sun; then the second and more vivid rainbow takes its place and goes through the same evolutions, enlivening and beautifying the scene in the most remarkable manner. Baines spent 12 days sketching the world's greatest river wonder and completed most of his paintings along his return journey. His watercolours, prints and oil paintings gave the outside world their first pictorial impression of the Falls, and no artist has since captured them with such skill. 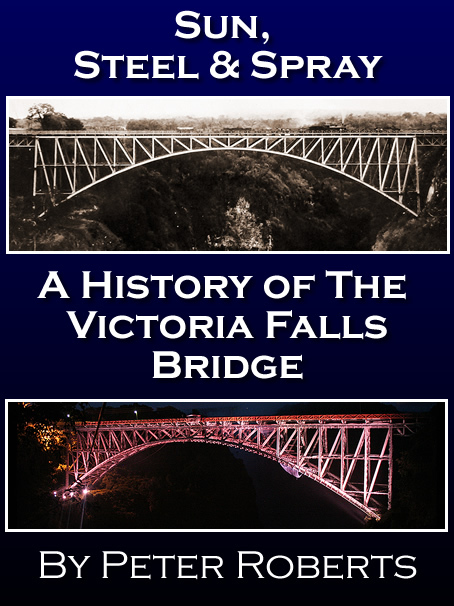 His portfolio of prints, 'The Victoria Falls, Zambesi River : sketched on the spot', was published in 1865. Baines describes "the most lovely coup d'oeuil [sic] the soul of the artist could imagine". The double rainbows, a unique meteorological peculiarity and visual characteristic of the scene, particularly inspired him:. How shall words convey ideas which even the pencil of turner must fail to represent? ...Think nothing of the drizzling mist, but tell me if heart of man ever concieved anything more gorgeous than those two lovely rainbows, so brilliant that the eye shrinks fro looking at them, segments of which rising from the abyss, deep as the solar rays can penetrate it, overarch spray, rock, and forest, till risin to the highest point they fail to find refractory moisture to complete the arch... Scene after scene of surpassing grandeur [presents] itself, till the imagination is bewildered and embarressed by so much magnificance... I began to believe that no man but an artist can appreciate these wonderful falls, and not even he till be strives patiently day by day to study and represent them. 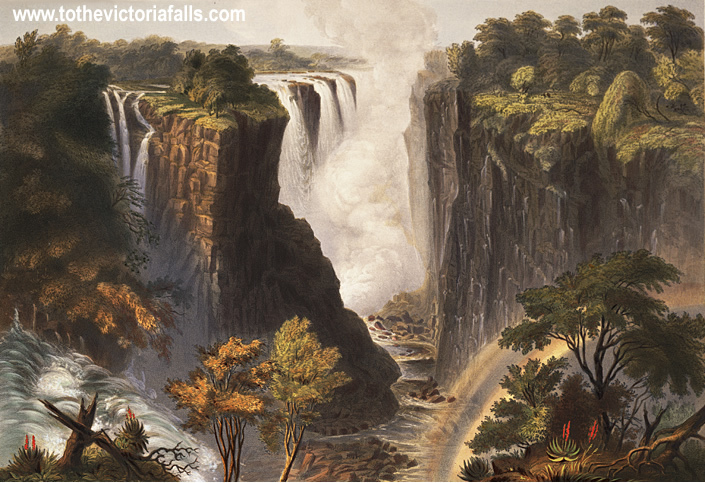 Baines, during and after his visit, painted many pictures of the Victoria Falls and these have now become world famous. Several of these are in the possession of the National Archives in Harare, having been presented by G Carleton Jones in 1945, and there are examples of his watercolour sketches painted when he was at the mouth of the Zambesi with Livingstone in 1858, in the Rhodes-Livingstone Museum at Livingstone. Baines, Thomas (1864), Explorations in South-West Africa: Being an account of a journey in the years 1861 and 1862 from Walvisch Bay, on the Western Coast to Lake Ngami and the Victoria Falls. Longmans, Roberts and Green, London. Baines, Thomas (1865), The Victoria Falls, Zambezi River, sketched on the spot by Thomas Baines, FRGS, 1862 (reprint Bulawayo, Rhodesia: Books of Rhodesia, 1969). Livingstone, David (1865), Narrative of an Expedition to the Zambezi and its Tributaries, London.